Financial planners have scrapped the old rules for emergency funds as the time it takes to find work has skyrocketed. The U.S. economy picked up a little bit of steam, growing at a 2.5 percent annual rate in the third quarter. But economists expect the unemployment rate to remain stuck around 9 percent for many months. To protect against a potential job loss, financial planners until recently advised clients to set enough cash aside to cover their expenses for three to six months. Today, six months is their starting point. And the amount of financial cushion should be based on each individual’s job security – the more risk, the bigger the emergency fund. It’s similar to the argument that an entrepreneur, for example, should balance his or her job risk by investing conservatively. To calculate an emergency fund, every household needs to know two things: how much fat they can cut out of their budget and how much they can expect to receive in unemployment benefits. Benefits typically cover up to half of the state’s average weekly wage. It now takes 10 months, on average, to find a new job. The pioneering behavioral economist Richard Thaler said employers and the financial industry should increase their efforts to help people prepare financially for their retirement. “Making it easy isn’t the most profound thing anyone has said. But if we want people to do a better job saving for retirement, make that easier,” he said last week at a Retirement Income Industry Association conference, backed by a wide-angle view of Boston’s skyline. 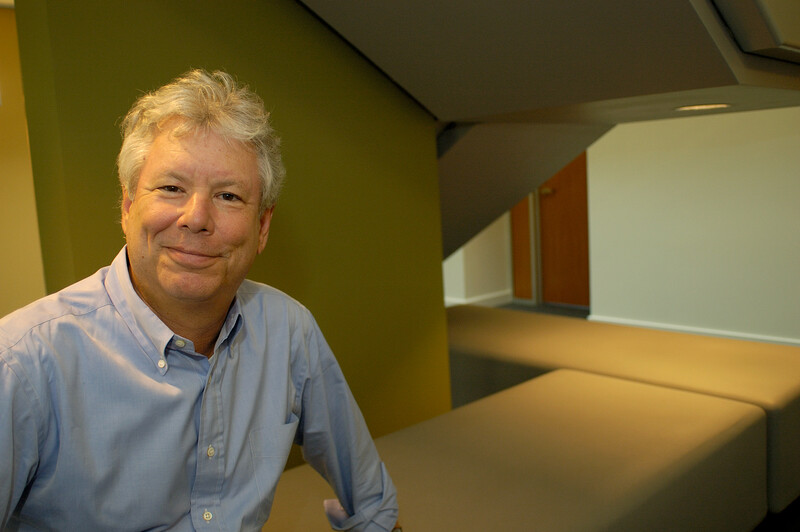 Thaler is co-author of the bestselling “Nudge: Improving Decisions About Health, Wealth, and Happiness” and a pioneer in a branch of economics that rejects the convention that people are “rational” when it comes to making decisions. Behavioral economists acknowledge that people are psychological beings who don’t always act in their best interest and often do downright perplexing things. One prominent example is employees who do not sign up for their 401(k) retirement plan, leaving the money from their employer’s savings match on the table. To nudge people to save, about half of U.S. corporations now automatically enroll their employees in their 401(k), according to consultants Callan Associates, though many offer it only to new employees. Before auto enrollment came into vogue, companies gave employees the option of signing up if they wanted to participate in the plans. With auto-enrollment, they must choose to opt out of saving, a strategy behavioral economists argue helps overcome the powerful inertia of doing nothing. In this humorous Ted video, Graham Hill advocates minimalism as an alternative to consumerism and showcases his 420-square-foot apartment in Manhattan. His living arrangement may seem extreme but residents of Tokyo have been living small for years, and his main point is well taken: he has reduced both his living expenses and his environmental footprint. Hill is a modern Renaissance man. He studied architecture, founded Treehugger.com to take environmental sustainability mainstream, and dreamed up the idea for those ceramic Greek coffee cups, a replica of the paper cups, found in art museum gift shops. 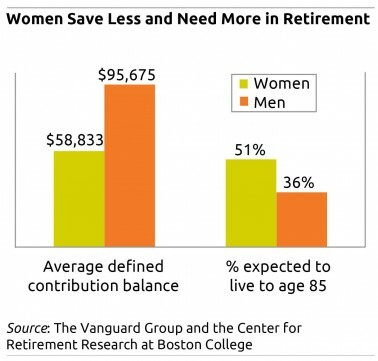 When it comes to retirement, we women are in lousy shape. We live longer, so will need more money when we retire. Yet we work less over our lifetimes and earn 80 percent of what men earn while we are working. As a result, we’ve saved less in our 401(k)s and IRAs. 51 percent of women worried they would not be able to afford retiree healthcare, compared with 44 percent of men. Financial data support women’s concerns. 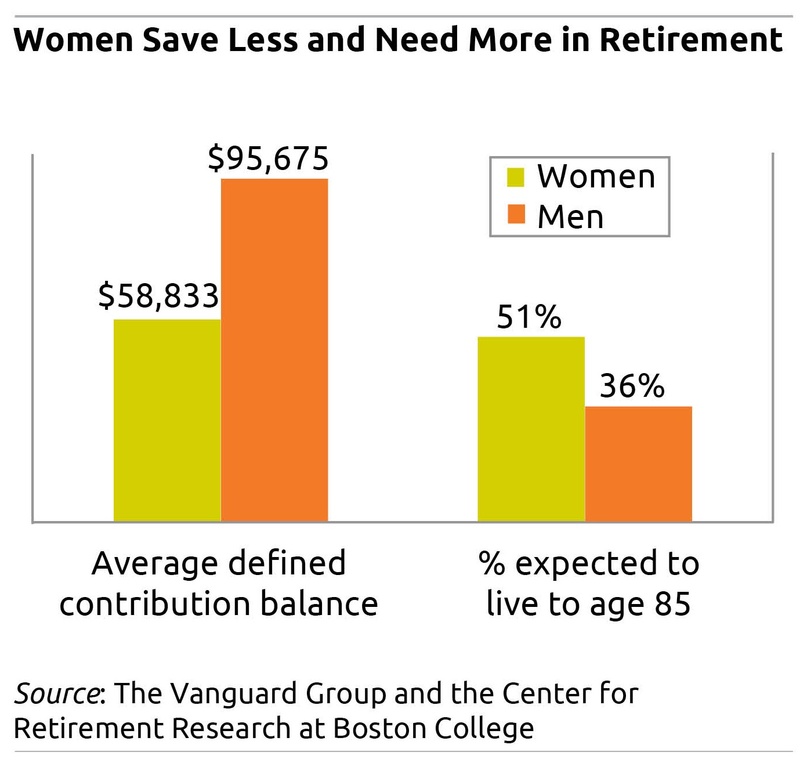 In 2010, the average balance in defined-contribution plans managed by Vanguard Group, one of the nation’s largest mutual fund companies, was $58,833 for women and $95,675 for men. The median balance was $21,499 for women and $33,547 for men. Saving money. No financial behavior is more important in this era of DIY retirement planning. And yet few things are more difficult for more people. To prod low-income people to save a little, foundations and the government design clever financial products or incentives – some work, some don’t. Academic researchers divine psychological tricks or behavioral mechanisms that might spur saving. Automatic enrollment in employer-supported 401(k)s is one such success story. A different solution to the savings conundrum comes from two marketing professors at the University of Toronto. Experimenting on subjects around the world – residents of a small town in India, Canadian college students, parents in Hong Kong – they found that individuals are more successful savers if they identify and work toward a single goal. Setting multiple, competing goals – college, retirement, summer vacation, a new kitchen, and the Christmas fund – was less effective and even counterproductive.